ROAR (1981). Director: Noel Marshall. Cinematographer: Jan de Bont. 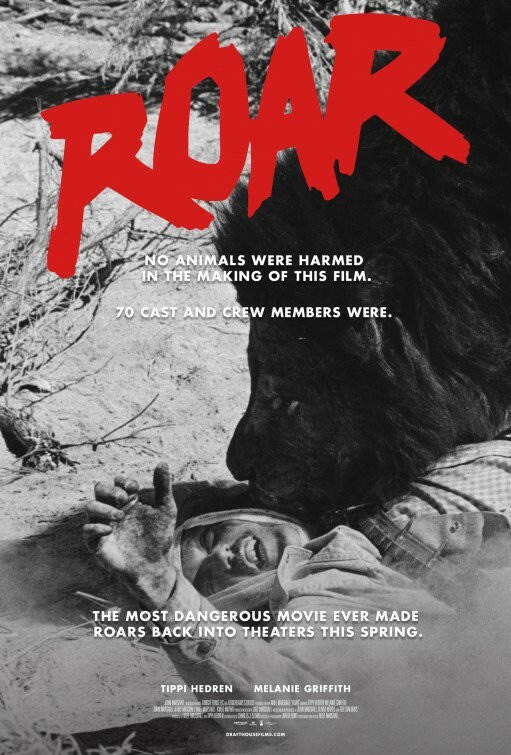 ROAR begins with a disclaimer from the American Humane Association stating that no animals were hurt as a result of this film. That’s the good news. The bad news is that some animals did meet their end as a result of flooding that took out much of the film’s set. And no matter how many animals made it out of ROAR unscathed, the humans in the cast and crew were not so lucky. There were several severe injuries and looking at the finished product, it’s a miracle no one was killed. The way in which ROAR was shot is even more shocking when you consider this 1981 film wasn’t a fly-by-night production by a crew of exploitation filmmakers of dubious morals. Actually, it’s a very pro-animal, pro-conservation film estimated to have cost $17 million and taken at least seven years to complete. On top of that, ROAR is largely a family affair, conceived and executed by Noel Marshall, actress Tippi Hedren and their children, which included a young Melanie Griffith. The inspiration for ROAR came when Marshall and Hedren came across a game reserve while shooting a film in Africa. They immediately became fascinated with all the wild cats – lions, tigers, ligers, panthers and such and the two wrote a film around it. The film they came up with is actually very simple. Hank (Marshall) is a conservationist living in the wilds of Africa. He keeps and supervises several families of lions, tigers and ligers on his estate. This has led to some fears from neighboring landowners. Early on, a couple of the cats claw the face of one particularly unruly individual and sink a boat. Hank tells the terrified and incredulous visitor to shrug it off. But Hank doesn’t have time to worry about that as his family is flying in from the United States. Hank hasn’t seen them for years, since he had left to start his preserve. He is anxious to greet them at the small airport several miles away, but unfortunately he was given the wrong time. Madeline (Hedren) and her children (played by their actual children and mostly using their real first names) arrive earlier than expected and by the time the family reaches the preserve, Hank has already left to intercept his family at the airport. He is constantly delayed, which means the family spends a longer time than expected without any human contact. Because believe it or not, every bit of peril you see in ROAR is real. In an original, possibly misguided move, Marshall decided to use nothing but untrained cats during the production. This means that no matter who’s listed as writer or director, it’s the cats that pretty much run the show. Marshall and cinematographer Jan de Bont (making his American debut) would set up an elaborate five-camera system and let the cats run loose throughout more than 90% of the film. Sometimes they wouldn’t do anything for hours and then sometimes they would be all too active. This is hard enough if you’re shooting second unit footage. But this aesthetic was also true of the main film in which people are supposed to deliver dialogue, expository information and hopefully get out with their lives intact. Because of the strange nature in which the film was shot, actors deliver their lines while lions claw at them and ligers crawl over their shoulders. It makes for an odd movie, one that feels largely improvised because it has to be. This also means that Marshall’s performance takes on an incredible natural quality, he really does seem like the ultimate crazy cat lady because that’s mostly what he was, a guy who just cared about these huge beasts and wanted to convey that they weren’t really that dangerous no matter how they bite and scrape everyone. It also means that Marshall’s family – his actual family, mind you – was really getting swiped at, bit, trampled on and smothered throughout the production. It’s an absolutely shocking tableau. In the film’s many action sequences, much of the family seems to be ad libbing their lines, or at the very least shortening their dialogue so they can get out of the way. The audience gets the picture of a family trying to put on a show while surrounded by animals that are actively trying to kill them. And yet, I’m sure Marshall and family (who would probably know better than I) would disagree with this assessment. ROAR goes to great lengths to show that the animals are deadly if they sense intruders. But these are merely survival skills shaped by instinct and generations of being hunted by human and animal alike. The antics of the cats are presented as more whimsical than anything else. The cats may be cornering a terrified family, but they’re also going through their belongings, exploring the home and in one amusing incident, pushing one another on a skateboard. The film ramps up the tension, but it’s almost as if everything behind the scenes – the camera, the editing, and the too-whimsical music – tries to downplay the very real danger present. When the danger passes, it seems to occur so suddenly that we feel we must have missed something. It’s a dichotomy that ROAR tries desperately to straddle with moderate success. They want to create suspense, but they don’t want to demonize animals that were already being hunted to near extinction. Hence, the musical score downplays the danger in ways that it shouldn’t have. The soundtrack is dopey and tone-deaf. What ROAR really needed was someone on the caliber of John Williams, a person who would be able to capture the majesty of these incredible animals while also creating a sense of tension. Inserts would have also been a tremendous benefit. The cast had to work around the cats, which gives much of the film a disjointed feel. This works fine, but we feel that a lot of story is getting lost in a sea of fur and teeth. A few establishing shots or close-ups of actors where information could be conveyed a little less breathlessly could have done wonders for the production. But as I mentioned before, it’s amazing the production was able to be completed at all, particularly without fatalities. Often cited as one of the most dangerous films ever shot, the injury reports from ROAR would seem to back up that claim. Cast and crew were routinely maimed during the seven-year production and it seems as though life off-camera was as perilous as when they were shooting. Noel Marshall was attacked enough times to eventually develop gangrene. He sustained injuries while trying to protect a cheetah from a brushfire and had to be hospitalized. Melanie Griffith had her face mauled and received fifty stitches. John Marshall was bitten on the arm and received 56 stitches. Hedren was bitten (either on the back of her head or her neck, depending on the source) and received 36 stitches in a shot that remains in the film. Cinematographer Jan de Bont was scalped by one of the lions and received 220 stitches, voluntarily returning to finish filming in part because he relished the challenge. Assistant director Doron Kauper had his throat seized by one of the lions and suffered injuries that nearly cost him his life. There are dozens more injuries where these came from. And then there was the flood that washed away much of the set, and much of the completed film up to that date. Tragically, in addition to some animals that were killed in the initial flooding, three lions had to be put down by sheriff’s deputies, including one of the principals. The film itself is fascinating, if only moderately successful on a dramatic level. The ambition is clear on the screen as are the noble intentions of the Marshall family. Seeing these beautiful creatures is something truly splendid. But of course, the film’s most hair-raising moments come from seeing the family nearly overtaken by these magnificent but deadly felines. These moments alone make the film worthy of a recommendation. And I won’t pretend I didn’t chuckle at scenes such as when Melanie Griffith is yelling, “Get me out of here,” because she’s trapped herself in a tipped over cabinet. And then there’s the rest of the film, which is endearing. Marshall’s pleas for conservation never break the fourth wall into preaching to the audience (the film saves that for the end credits, where important information about wildlife preservation is conveyed). His relationship with the locals, including his partner Mativo makes him a friendly protagonist. And thankfully, despite failing at the box office, ROAR led to Hedren founding the Roar Foundation, which relies on donations and tourist dollars to help care for exotic cats unable to survive in the wild. ROAR is a film that works partially on two separate levels, creating a whole experience that is worthwhile overall. On the one level, you are interested in the characters on screen and sort of proud that they have taken an adventure motif to convey a positive message. And on the other, you are watching those same characters constantly overwhelmed by their animal co-stars in what has to be one of the strangest and most reckless productions in film history. Recommended.